Up in northern WI for the holiday bumming around the Antigo area (there are apparently some hugely impressive fireworks put on in Burnamwood that we plan to check out) and on the way up my fiance and I swung through both Bud Willman's lunch and Joe Rouer's. Bud Willman's was hands down the best burger I've ever had. 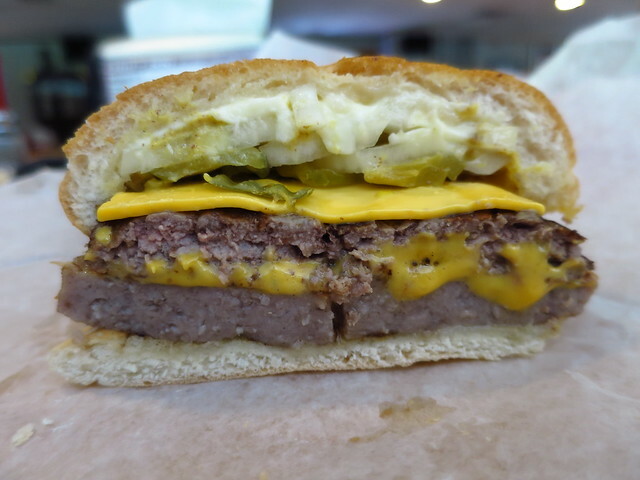 I agree with Ronnie that the double is really the way to go - otherwise the patty is just too thin, the bun is too thick, and the meat is too easily overcooked. The double is just right in terms of ratio of ingredients. Just incredibly good. That being said Joe Rouer's was my favorite spot of the trip so far. The single burger was a great snack, and I saw people ordering them by the tray-full. If we hadn't already eaten and didn't have to keep driving, I could spend a good number of hours here. The buyers are still really, really excellent and might be my favorite if I didn't just top at Bud's. Everyone is incredibly friendly, all the food seems quite solid in addition to the legendary burgers (apparently now over 4 million sold! ), and the drinks are dirt cheap - Ketel and sodas were $3.50 and brandy old fashioneds were $4 with a garnish including olive, cherry, and a pickled mushroom. Honestly, they are only about an hour a part from each other, so I'll probably always hit both whenever in the area. An interesting article appearing in 'On Milwaukee' about Kroll's East. I first went there in 1960 when on the way to Door county and continued until Kroll's West opened and was easier to get to on the way to and fro to Crivitz, Langlade and beyond. I never knew the two were different establishments. So a side by side day trip comparison is on order probably the day of the Packer Shareholder meeting, July 24. Here's a quartet from a trip up the lake last summer. Those paying heavy attention to the style of burger found up and down Lake Michigan (starting in Sheboygan and extending to the WI/MI border) will recognize that style within these next four stops. All of them using fresh patty's of locally butchered beef that are char grilled before being placed on a well buttered hard roll. I'm not sure this regional style has a name so I guess we will call them Sheboygan style burgers. Here's four more in order, from Chicago. Our first stop was a place long on my list. 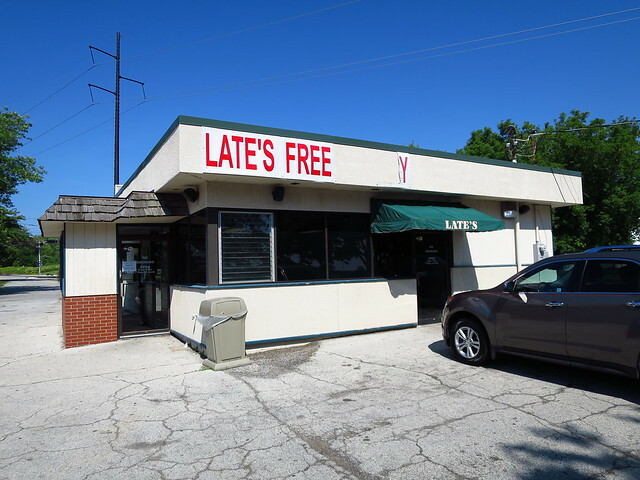 I know Late's has been mentioned on this thread and elsewhere as being as good as if not better than Bud Willman's (also in Manitowoc). I cant find an exact date on Late's but I did find mentions going back to the 60's. As you can see the outside is pretty dilapidated and the inside is no different. Aside from the burgers the curds are also known to be wonderful. Were they? Sure. 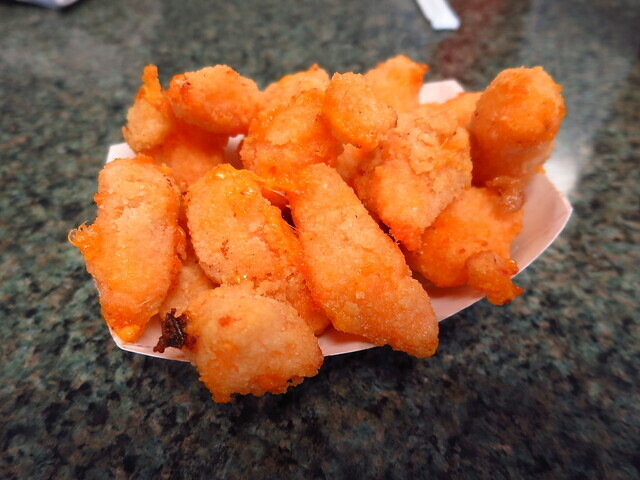 Most fresh fried cheese curds are. The burger however was pretty uninspiring for this style. It was smaller than most and because of that it's basically a requirement to get a double in order to balance the meat to bun ratio. I feel like Late's has seen better days. Moving North the next stop was the best stop of those featured in this post. Basil's II is a classic Wisconsin tavern that's pretty much in the middle of nowhere. Doesn't matter where you are in Wisconsin there's always a bar nearby. Basil's II has been established since 1984 however the bar burned down in 1993 so they had to do a full rebuild. The original owners sold the business to their sons. The sons last name is Kroll so you have to believe that there's some connection to Kroll's in Green Bay. 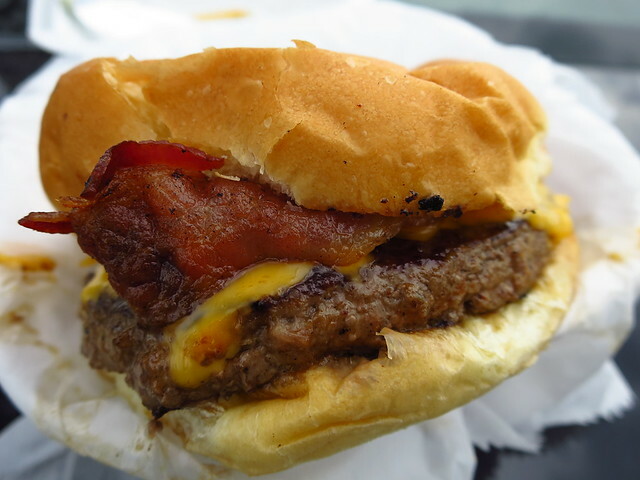 Especially when you see how they do the burgers which is over a live grill just like Kroll's. I didn't get a chance to ask where Basil's gets their buns from but these were as crunchy as the Cuban bread is down in Miami. 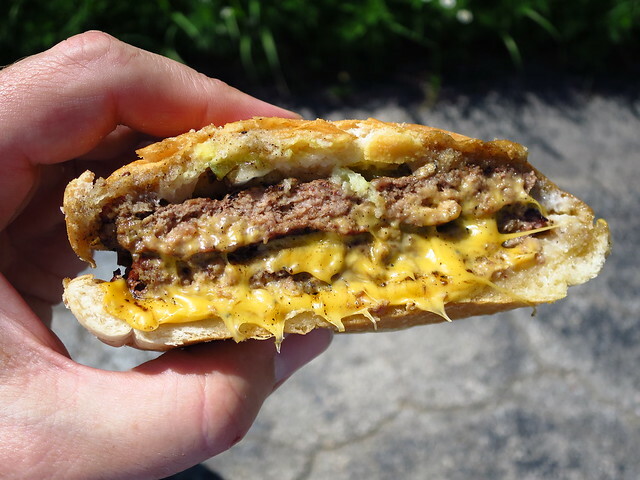 They worked perfectly on this double cheeseburger which was full of fresh juicy char grilled beef and oozing with cheese. Most other buns would've succumbed to the sloppiness. 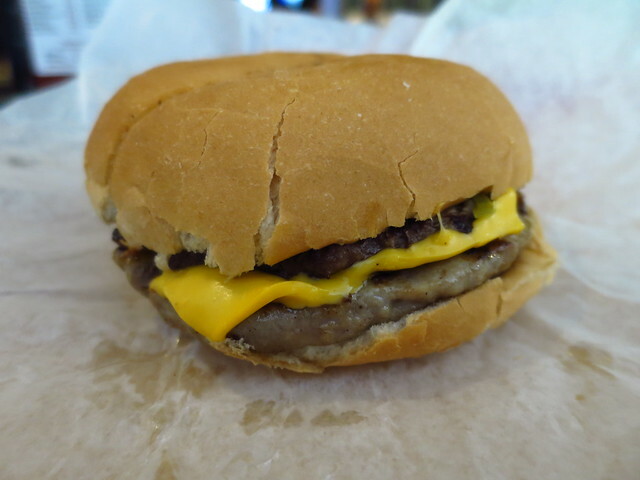 Basil's also does a brat burger and they do so in the traditional Sheboygan way. These are made with a brat patty instead of a split sausage link. So it looks like a burger but taste like a brat. Another fine example of this regional style. Standard toppings include mustard, onion, pickles, butter, and ketchup should you need it. No thanks for me. The next stop takes us outside of Green Bay to a popular place for Packers fans to talk about last weeks game, or if it's summer, the upcoming season. It's also popular with outdoors men in the area for hunting, fishing, snowmobiling etc. 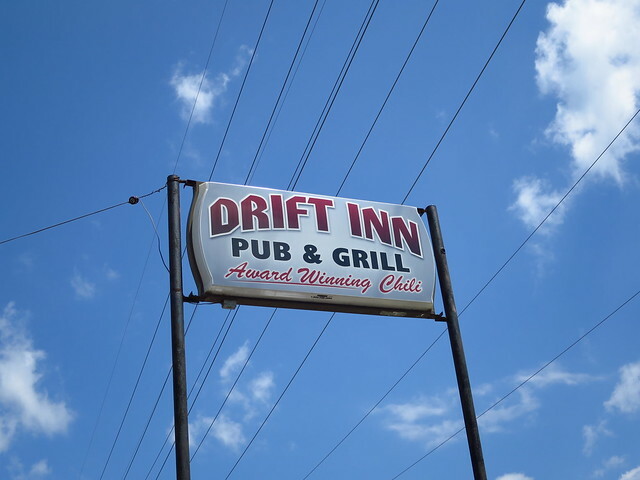 As you can see from the sign the chili is popular at Drift Inn. It's been served the same way since 1978 though the bar itself goes back to the 50's. Of course I had to try a bowl and unless you want to expose yourself as not local you need to order it with everything which means spaghetti on the bottom. Even though I wouldn't serve it like this at home I for one am not offended by spaghetti in chili and can happily enjoy a Midwest blend now and then. I liked this bowl. Aside from the house chili it's also the burgers that keep customers coming back. 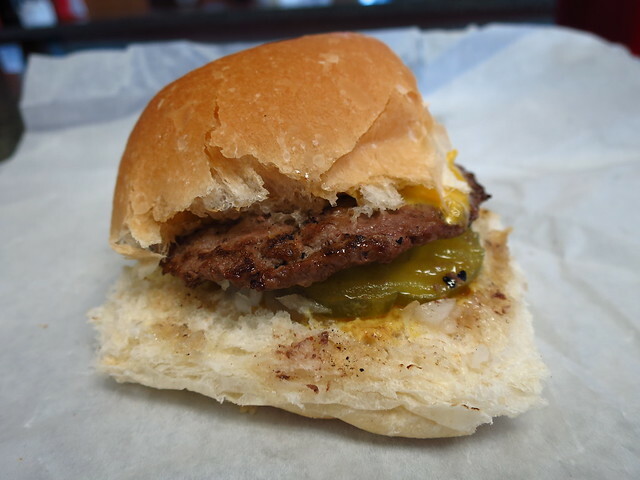 Fresh patty's of locally butchered beef are delivered fresh daily. They go over a charcoal grill and if you order the namesake burger you get both a beef patty and a brat patty. A Wisconsin style combo so to say. 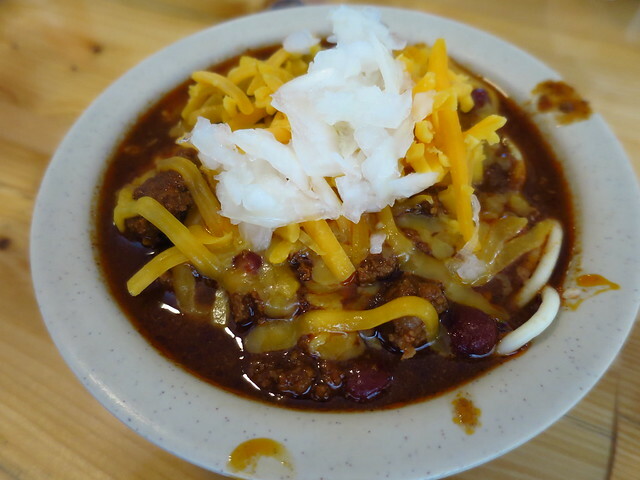 These too are popular in and around this area as there's been previous places mentioned that serve a Wisconsin style combo. I like these bad boys but prefer one or the other or better yet one of each served separately. Good food and a fun atmosphere make this a place I'd get back to next time I'm around. 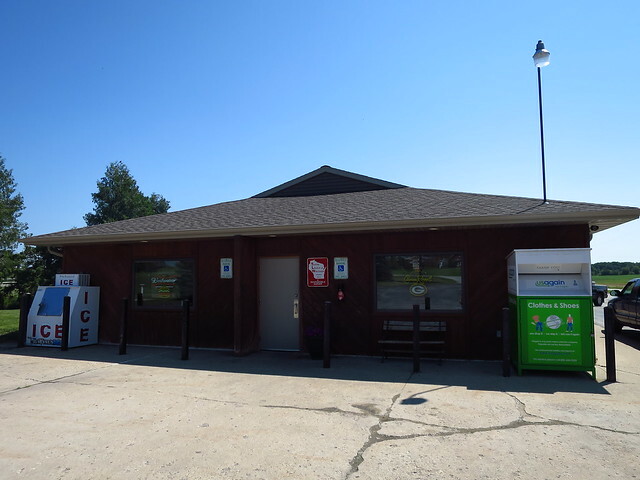 Final stop of this round-up takes us to a gas station in Green Bay. Hill Top Cafe is a pretty nonchalant type place sitting to the side in a BP. I was surprised by how many locals were dining in. Must be a popular place with them. Easy to understand why when your burger comes out. Nothing about this was a standout but everything in it from fresh beef to the locally made bun was above average. In terms of size it was one of the bigger ones as far as circumference goes. Much better than most gas station options when it comes to burgers. Pretty much what you'd expect from a place in a great burger state. I don't know how the 'style' of these burgers started nor the history but there is a 'style' which I don't think can just be termed 'Sheboygan' because of the places around Green Bay. I do know in the 1960's there was Kroll's East and Rudy's in Menasha, each serving a charcoal grilled, crusty bun with butter. Kroll's was primarily burgers while Rudy served a 'Minute Steak' as the primary offereing with burgers and brats on the side. Rudy would grill the brats and keep them warm in a little pot with liquid. Of course if the fishing was good, Rudy's was closed. As an update the Packer Shareholder meeting was on a Monday so no Mihm's as they are closed on Mondays. Kroll's west had their lots blocked off to prevent Shareholders from parking but we had ordered by phone, so we got fries and two burgers and took them to the wayside on I43. The fries looked like and tasted like they were from the day before and warmed in a microwave! The burgers were a little better but not a lot of butter or much to distinguish them. I can not recommend Kroll's West at this time. In conversation with a volunteer information lady at the Shareholders Meeting who has lived all her life in Ashwaubenon where part of Lambeau Field is actually located, Kroll's East is the place to go. As an aside, I purchased some thin sliced dry aged ribeye from Joseph's, got some crusty buns, sautéed them in butter, charcoal grilled the ribeye's, had mine with sliced raw sweet onion, generous pat of butter and mustard. 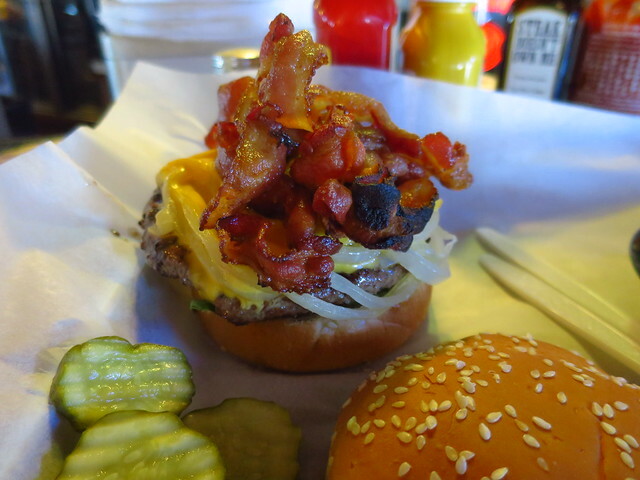 Just got back from a week in Hayward and the burgers/food at Blackiron were outstanding. Cheese curds, sliders (meatball and Italian beef) and 2 different burgers were put back on Wed night and we all agreed a return trip was needed before heading home. Well, we walked into their Friday fish fry - also excellent, light & crispy beer breading with juicy Alaskan cod and house made sauces. Hand cut skinny fries done just right. Nice craft beer selection on tap (they had Moon Man, 'nuf said). The proprietors are south siders and the chef comes out of the Gibson's chain. Hands down the best grub we had all week. ziggy wrote: OK, got a few minutes at work earlier so I started this up and I just finished it after eating dinner (which was unfortunately not a burger). Thanks for all the leg work, Da Beef. I look forward to trying more of these out now that I can pull this up anytime I find myself across the curtain. I only included places that Da Beef has posted about, even though there are some good contributions from others. I may add another layer for those. I also may color code it based on category of establishment but I really just wanted to see them on a map. Each pin has a link to the post where Da Beef covered the spot. Let me know if you have any issues or if you want editing rights to spruce it up. REQUEST: Can the mods edit this map link into Da Beef's first post on page one of this thread? Delete this post after it's done. Thanks. As long as Da Beef gives the ok, yes. The Red Oak Inn located in Kenosha County on HWY 45 has relativly new owners. My wife is friends with one of the owners, a mother & daughter, and has eaten there a few times. To get me to go, she intrigued me with a Whiskey tasting of two Wisconsin Distilleries. But the more signifacnt factor was the food. Dedicated to local sourcing the Bison Burger came from just down the road. Correct answer is rare for such lean meat. A large perfect rare, not blood red but a solid light pink to red burger arrived between two pieces of homemade thick sliced and butter toasted bread with browned onions and huge hand-cut crispy fries. A large steak knife accompanied the burger which was used with a fork after a couple of normal burger eating techniques fell by the wayside. No mustard or other condiments came and none were required. Just great Bison taste. I was very happy. The little plate served with the Whiskey’s was slow roasted pork belly on a plate of grits. I detected coconut and some Miso flavors. Later talking with the owners and chef, all ladies, I learned the sauce was indeed a coconut oil, bourbon and miso prep. Just an outstanding dish! I have long been looking for a place to replace Radigan’s as our local fine dining restaurant and it looks like my wife found it. 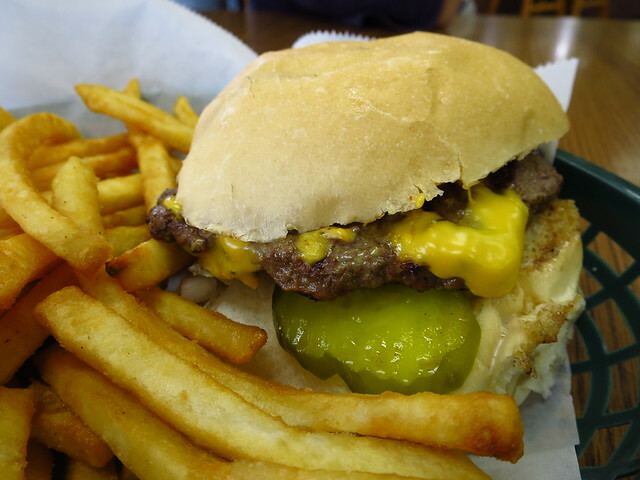 Hit Joe Rouer's on Dec. 30 for two, as usual, wonderful cheeseburgers. My these are good. Puts a smile on my face every time I go. Been going since 1980 (the original prior to burning). Always, always consistent. Saw Da Beef's post about Basils 11 upthread, so stopped there on Jan. 2 on way home. Excellent double cheeseburger with great buns. They had polish sausage with kraut and mashed (w/gravy) as the special. That was hard to pass, but had to hit the burger. Highly recommended. budrichard wrote: The Red Oak Inn located in Kenosha County on HWY 45 has relativly new owners. We're going there for dinner tomorrow. Two weeks ago we had a party of eight, Friday evening. Everyone but me had a good experience from Mussels to duck. My Bison burger came with a Brioche bun, was over done and soggy fries. Kitchen immediately made another burger to a correct rare. I was happy. On my next outing I will ask for the thick toasted bread instead of the Brioche bun and ask for the burger to be delivered to me at soon as it was done. I’m sure the first burger was correctly done but rare if it sits will eventually turn to medium. We had a delightful evening. I visited the Bison farm and came away with ground, rib eye steak, cowboy rib eye and a Tomahawk steak. So far the rib eye and ground have been superb. Chile John’s Beaver Dam Wisconsin. Stopped yesterday for lunch first time in many years. Chile John’s was opened in 1920. I started going about 1967 for breakfast EARLY in the morning before hunting around Horicon Marsh. Great stack of pan cakes. After hunting we would drop off our birds for cleaning in Beaver Dam and have lunch at John’s. Bowl of chile, double cheeseburger and fries (served family style). Great brown mustard. Back to the future, after canoeing in Horicon Marsh, my wife and I would have a late breakfast at Chile John’s. John taught my wife wife how to eat a stack of pancakes. Butter between the layers, with milk also and then syrup on top. Short story is my long time best friend and hunting buddy passed and my hunting days are over. But Chris, John’s son is still running the place. A few taps have been added with tap root beer available but the place and menu are still the same with liver & onions still a staple. Beaver Dam is a small Wisconsin town and if we lived in Beaver Dam, there is no doubt in my mind that we would be eating, drinking and walking home many a night. Cheeseburger was very good and fries, hand cut, right in front of us sublime. Great Wisconsin Brown mustard. budrichard wrote: John’s. Bowl of chile, double cheeseburger and fries (served family style). Great brown mustard. I grew up in Milwaukee, went to school in Madison. I remember, barely, a night long ago a few friends and I got a hankering for Chile John's and decided to drive to Green Bay from Madison. The fact it was snowing, and this was not a very good idea, never came up. I also remember when Silver Springs horseradish, along with horseradish mustard, was sold exclusively in bars. That horseradish packed a punch, said the master of understatement. Richard, thanks for sparking fond, if somewhat hazy, memories. I apologize in advance if this has already been mentioned, but I just inhaled a great, great burger at The Garage Bar in Kenosha. The pic isn't mine (and makes the burger look bigger than it actually was) but is similar to what I had (sans the bacon)--two griddled thin burgers on a squishy bun with grilled mushrooms between the patties, topped with raw onion and Wisconsin cheddar, with kettle chips on the side. Just awesome, the best one I've had in many a moon. I realize I never posted a trio from Madison. One of America's great burger towns. Today's trio is a story of ok, good, and great. 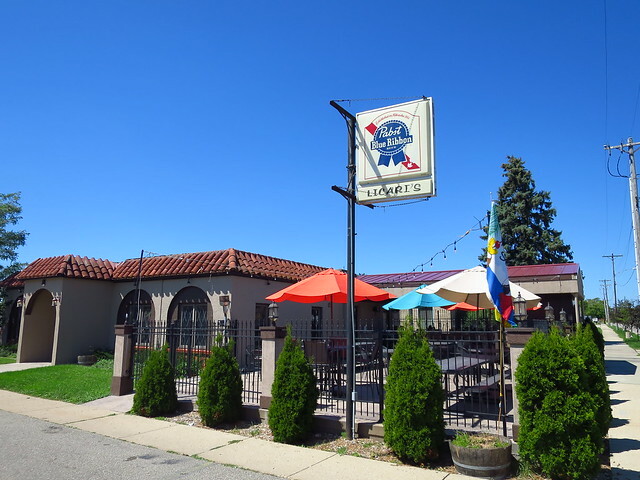 All of the spots we'll be visiting are classic Wisconsin taverns. All of which are located away from Downtown Madison and the University. Real locals type spots that college kids rarely if ever make it into to. All of them cooking the burgers in the classic Wisconsin tavern style of an open air kitchen behind the bar. First stop up is a place of greatness. 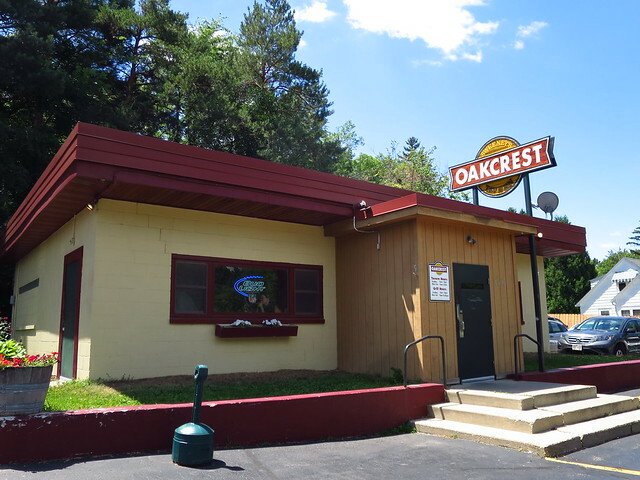 The Oakcrest Tavern evaded me until about two years ago when I first stopped in. Not sure what took me so long to find this place bc they've been open since the 1950's. Whenever someone asks me why I think Wisconsin is America's best burger state I use the example of what Oakcrest is doing which is what so many other spots in the State mimic. The 1/3 lb patties of beef come from a longtime butcher across the street, it's all steak trimmings. The buns come from the local bakery also down the street and the cheese choices are always on point as this is Wisconsin after all. I'll be damned if this isn't one of the finest bar burgers in the land. Simple yet succulent. Headed to Madison mid Sept. and I plan on making my third trip here when there. 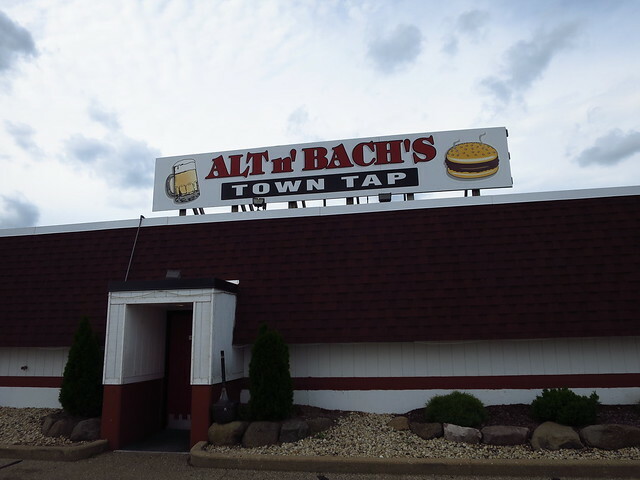 Next stop is a popular bar called Alt N' Bachs Town Tap. Another prototypical Sconnie bar. Personally I cant get enough of them. Heard lots of good stuff about the bacon cheeseburgers from here so that's what I went with. Damn was it good. Maybe not good enough to overtake any spots in the Top 10 in the State Rankings but it was pretty much perfect in that bar burger type of way. Last stop is my least favorite of the three. Why? I witnessed something I've never seen happen here. I watched the bartender grab our burger from the freezer and plop it onto the flattop. Thus I lost interest in Licari's Tavern real quick. I should point out that the burger itself wasn't one of those hockey pucks lots of fast food stops serve. It very well might've been quality beef I was just taken aback by the fact it was frozen. Never seen that out here. Other than that Licari's is a classic Madison tavern (one of it's oldest) that's pretty much always filled with locals. Cool spot for a beer. On the East Side, look up a place called Slices Bar and Grill. 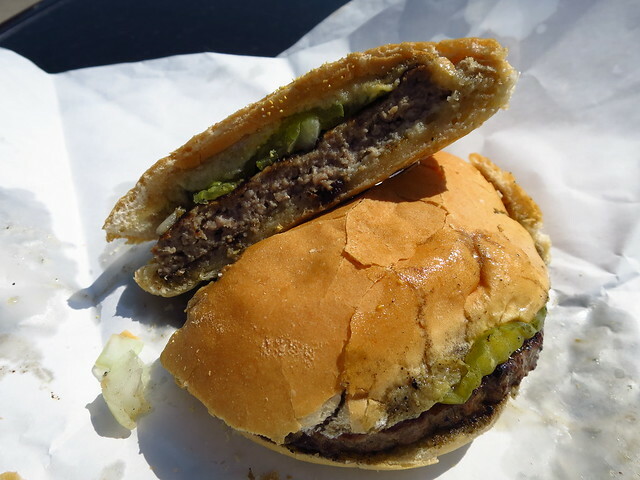 Great burgers with fresh meat from the Jenifer Street Market (not a bad stop itself). Off the radar local place, but worth a stop for a very good burger. I am sure you have been to Blue Moon near the University. A decent burger here. Beef - Another classic Wisconsin tavern for a burger is Brothers 3 on Fair Oaks Ave. Actually pretty close to Slice's mention in the post before this one. Both are 10 minutes East of the Capital square, away from the State St. crowd. I stopped just this week at Oakcrest on Da Beef's rec. Classic WI tavern, packed at lunch, friendly and cute service. I watched the grill action from the bar. 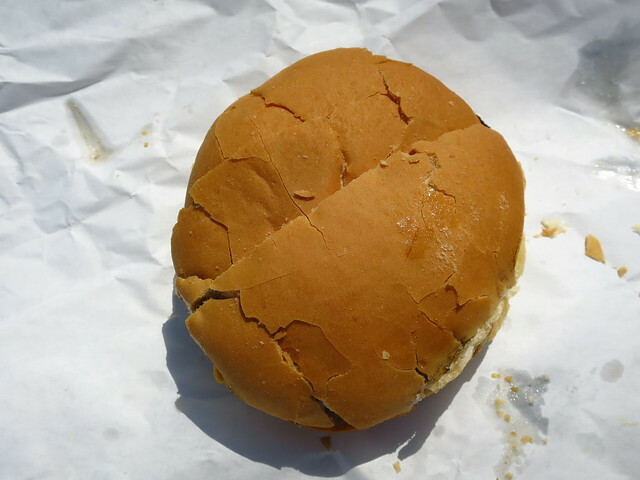 The burger was smashed from a ball onto the char-grill. This was the best of its kind. Clean, pronounced beef flavor, cooked perfectly to medium with great char. A thick burger to withstand plenty of toppings. I prefer a thin, greasy, griddled burger with minimal toppings. But I appreciated how this burger somehow ate on the lighter side and did not weigh me down for the 2 hour drive back to Chi-land. As Beef remarked to me, like a backyard BBQ burger, made perfectly. We'll be at Fred's Bar in Burlington (Home of the World's Best Burgers) tomorrow at 11am with a bunch of friends from Roadfood.com. Anyone who'd like to join us is welcome. If you're interested, please let us know ahead of time. A lunchtime table at Fred's on a nice summer Saturday is tough to get. I wouldn't to see anyone left out. 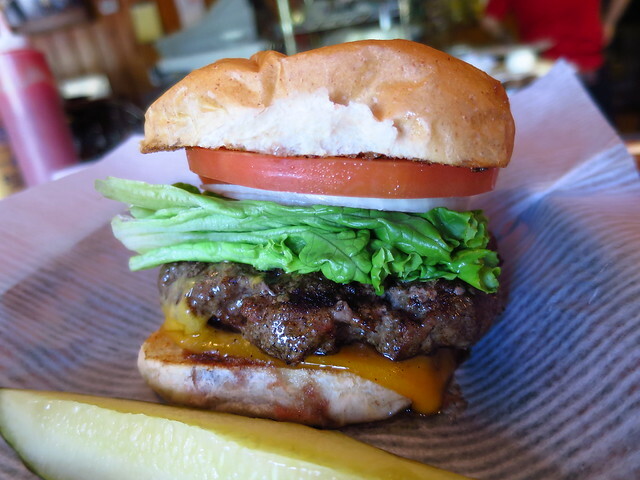 Hey Beef, you mentioned you had a top ten for Wisconsin burgers. What are your current Top Ten? I've added Oakcrest Tavern to the must have list. Finally made it to Gosse’s two weeks ago on a Saturday morning. Had the steak sandwich which had almost all of the attributes required for a Wisconsin burger or steak sandwich, missing the charcoal. No char on the steak but a good amount of butter and a nice crusty bun. My buddy had the Perch sandwich which he pronounced very good.